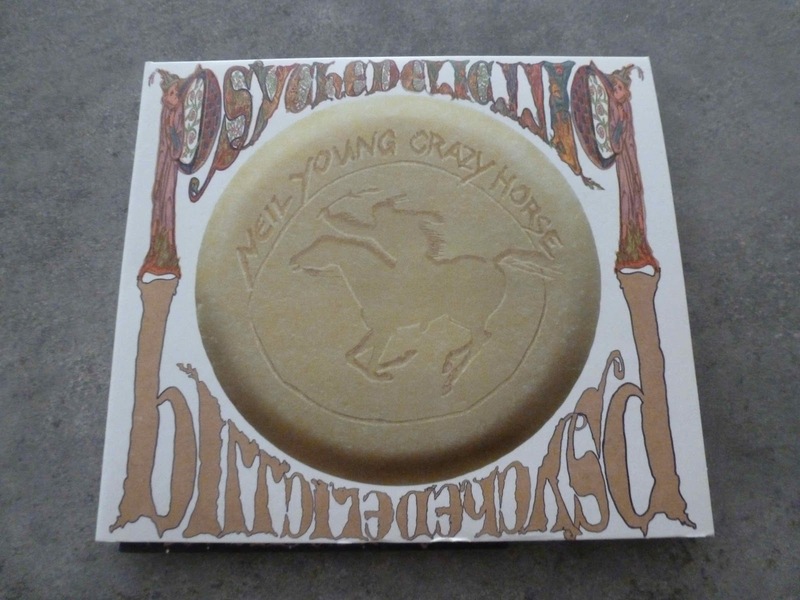 There's a pair of chicken and the egg statements that spring to mind when you're looking at something like the Neil Young with Crazy Horse album they've decided to label Psychedelic Pill. Did consumers stop listening to albums all the way through in sequence because artists have stopped making grand artistic statements that hang together seamlessly? Or did artists stop making grand artistic statements that hang together seamlessly because listeners stopped listening to albums all the way through? Anyone who's read Neil Young's Waging Heavy Peace will have no doubt about where Neil stands on the matter. We're supposed to listen all the way through, which is fine up to a point, and that point comes when you decide there are things hereabouts that justify employing the old shuffle button. Actually, when it comes to recent Neil activities you probably need to link Waging Heavy Peace, Americana and Psychedelic Pill because they're all part of the same process. Different aspects of that process, but they're definitely interlinked. The book, of course, came first, and we've already had a look at Americana here, but now it's time to look at Psychedelic Pill and we need to think about the links a bit. Looking at Americana, I remarked: Regardless of how prolific you are, sitting down to write a book (Waging Heavy Peace, apparently semi-autobiographical, due out later this year) the effort’s possibly going to steer you away from writing songs and while you’re thinking about the past you’re going to remember things you were doing back when you were starting out in the early sixties. There's an additional factor revealed in the pages of Waging Heavy Peace which appears to have some bearing on Psychedelic Pill. The book, Americana and the new album are all the work of a clean and sober Young who's eschewed the use of marijuana and alcohol, apparently on medical advice. You might be inclined to question whether this matters at all, and for most of us it probably doesn't. As far as Neil's concerned it probably doesn't either, but where these things are mentioned in the book he's not sure about song writing without the altered consciousness or chemical enhancement because it's been a while since he's written a song. So we seem to have a book in the process, and the process had reached a point where he could switch his focus towards different projects, which seems to have been the point where he started thinking in terms of Crazy Horse again. With the Horse back in the stable they need something new to play, and the WHP manuscript has had Neil thinking back to his days on the road across the prairies with his early band (The Squires). You're thinking about that stuff, you need something to work on with the Horse, so you head back to that material. Fine. There's a certain amount of logic there. With Americana in the can the songs apparently start to flow, and that delivered most of the material here. Given the fact that Neil had a number of matters that were occupying his attention you're hardly going to be surprised to see them turn up again. We're talking about a man who'll wander away from his tour bus, as described at the beginning of Nick Kent's article Neil Young and the Haphazard Highway, leaving instructions to the driver to pick him up a few miles down the road, visualise something that fits the vibe of the landscape he's walking through and turn it into something anthemic in the genre that has currently caught his attention. The problem, of course, lies in Neil's tendency to channel whatever vibe he's into, and proceed without the intervention of an editing force. That means if you’re into concise statements you’ll be steering clear of the opening Driftin' Back here. Actually, if you’re into concise statements you’ll be steering clear of Waging Heavy Peace as well. Driftin' Back is, to a large extent, symptomatic of the whole of the sprawling double CD statement, and your reaction to the track will probably define your attitude to what follows the twenty-seven and a half minutes. For a start the Hey now now, hey now now chorus makes for a substantial, and quite effective ear-worm. I’ve been trying to get the thing out of my head for days, but, on the other hand, the grumpy old man trying to find inner tranquility while everything around him needles his consciousness gets your goat after two or three hearings. Having read WHP you know where he stands on his new format for high quality digital music and the rest of his critique of spirituality, MTV, contemporary listening habits, the degradation of sound quality in recorded music (when you hear my song you only get 5 percent, you used to get it all) and the reduction of Picasso’s art to digital wallpaper hardly comes as a surprise. The band speeds up and slows down, ebbs and flows, locks together and drifts apart as Young scatters verses across the landscape, filling the rest of the terrain with swathes of guitar like you haven’t heard since, well, the previous NY/CH recoding. But the marathons resume with close to seventeen minutes of roughhewn guitar on Ramada Inn, a clear-eyed and coherent not quite eulogy for a long-term relationship now that the kids have grown up and flown the nest. It’s Greendale-style storytelling, uncharacteristically focussed as Young looks at the sacrifices it takes to keep things afloat, more than a quarter of an hour of shimmering sentiment and melancholy analysis conducted in the temporary shelter of a motel room against an alcoholic background. Gut wrenching, epic, and arguably as good as anything he’s done in forty-plus years. Born In Ontario closes the first disk with a trip down memory lane, cousin of Homegrown in much the same way that the title track reflects past glories. It’s a paean to his birthplace and his Canadian heritage while acknowledging the good fortune he’s experienced since leaving the prairies behind. It rocks along nicely, offering much needed light and shade after Ramada Inn, and if there’s a track hereabouts that’s suited to high rotation on the radio this, rather than the title track, is it. Or maybe it’s Twisted Road‘s recount of Young’s early encounters with the music his heroes—Bob Dylan, Hank Williams, Roy Orbison and the Grateful Dead—produced in their heyday, with Dylan’s lyrics rollin' off his tongue/Like Hank Williams chewin' bubble gum. Let’s just leave it at lightweight, shall we? She's Always Dancing repeats Driftin’ Back’s acapella intro > thudding Horse jam treatment and seems to reprise the title track’s pill-popping bopper for around eight and a half minutes of riffing between vocal choruses. Tight harmonies, trademark Neil guitar, it’s pleasant enough, but on an album that includes something like Ramada Inn most other tracks are going to pale by comparison. Continuing a long held Neil tradition, For The Love Of Man brings out a song that’s been around for years (as in Silver and Gold, Ordinary People and Hitchhiker) and provides a welcome change of pace with a comforting ballad and a lyric that pays tribute to Young’s severely handicapped son Ben. Which brings us to the album’s other major set piece, the monstrous (and I use the term deliberately) Walk Like A Giant. According to film maker Johnathan Demme the central used to feel like a giant, and now I feel like a leaf floating in the stream image stems from Neil’s 2005 aneurysm, and the rest of the lyrics fit comfortably into that retrospective feel that pervades the rest of the double album, but there’s an interesting contrast between the jaunty whistled hook and Young’s raging reflection on his (sorry, our) generation’s failure to change the world, which was what we thought we were out to do some forty-five years ago. Around ten minutes in, Young lets the giant out of the box in savage swathes of white noise lashing the landscape much, you imagine, as a deranged Tyrannosaurus Rex might have done back in the days when there were, literally, giants walking the earth, savage squalls of noise stomping across a landscape that’s 100% Crazy Horse territory. After that, I guess, anything’s going to be a let down, so perhaps one shouldn’t be too harsh as far as Psychedelic Pill (Alternate Mix) is concerned, but if its sister seemed inconsequential wedged between Driftin’ Back and Ramada Inn, the alternate version definitely comes across as lightweight after Walk Like a Giant. And if you do the stats, eight tracks (nine if you count the alternate mix as a separate entity) with three definite keepers (two and a half if you’re not totally besotted by the whole of Driftin’ Back) that occupy two-thirds of the ninety-odd minutes is a much better strike rate than you might have anticipated looking back over some of Neil’s recent first thought is best thought efforts. Very much in the whatever’s occupying Neil’s mind tradition of Fork in the Road, but with added Horse.